Slimy, pink, often seen with dirt or fishing hooks. What is it? The worm, of course! But how well do you really know them? Did you know that some worms can be as much as 115 feet long? Or that worms evolved with the dinosaurs? You’ll learn that and more in Elise Gravel’s book, The Worm. Gravel’s The Worm introduces children to the titular invertebrate with a series of interesting facts, accompanied by simple, charming artwork. 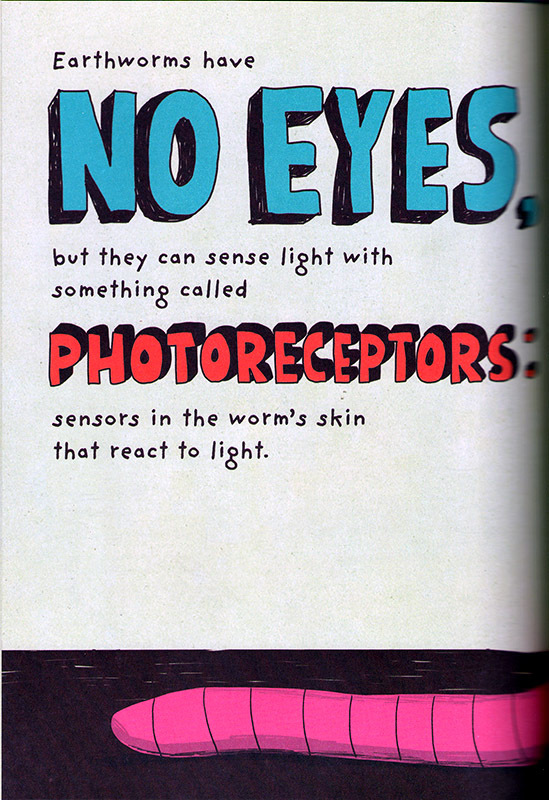 Each two-page spread presents a fact about worms, along with artwork demonstrating–or commenting on–the text. For example, the description of how a worm moves (“Earthworms move by squeezing their muscles, causing their bodies to contract and expand.”) is accompanied by a helpful illustration; when the text is less kind to the worm (“An earthworm is basically a long digestive tract inside a muscle tube. It’s that muscle tube that’s slimy and disgusting.”), the worm doesn’t take it lying down, so to speak (“Hey! I am not disgusting!”). I enjoyed reading this book. The highlight is certainly the illustrations, but the book’s educational content is interesting too, including some facts that even adults may not be familiar with (“many kinds of worms are hermaphrodites, which means they have both male and female reproductive organs”). The Worm, a translation from the French (original title: Le ver), is part of Gravel’s Disgusting Creatures series, the other entry in which is The Fly, to be published simultaneously. It’s recommended for ages 6-9. The Worm is on sale March 11, 2014. Disclosure: this review is based on an advance copy received free for review. What were the dinosaurs like? What did they eat? How do we know about them? In My Visit to the Dinosaurs by Aliki, a Let’s-Read-and-Find-Out Science Book, children can learn about the different kinds of dinosaurs, with information both about the dinosaurs themselves, and how we come to know about them, through fossils. This one is good, but I don’t like it as well as the other two books in this series that I’ve reviewed, Ducks Don’t Get Wet and What Makes Day and Night. The illustrations are nice, but the book is more like a collection of trivia than the other two. Still, it’s quite a good book for kids. I’d recommend My Visit to the Dinosaurs especially for kids interested in dinosaurs, but anyone might find it interesting. It’s a solid children’s picture book, well worth reading. Why is it sometimes night, and other times day? Why does the sun seem to move across the sky? Does the moon have day and night? These questions (and a few more) are answered in a clear and understandable fashion by the excellent children’s picture book What Makes Day and Night by Franklyn M. Branley, illustrated by Arthur Dorros. What Makes Day and Night is a Let’s-Read-and-Find-Out Science Book, which explains that the Earth is round, and rotates once a day, causing the apparent movement of the sun across the sky, and therefore causing day and night. This explanation is accompanied by great illustrations, as well as a beautiful photograph of Earth, taken from the Apollo 17 spacecraft, which help make these basic science facts accessible to the young reader. I’d highly recommend What Makes Day and Night for young children. It encourages curiosity and a rational view of the world, excellent accomplishments for any children’s book.